The India’s 500th Test Match creating various records Today on the 4th day of the Test match. The Indian Spin bowler, Ravichandran Ashwin bagged his 200th test wicket today on Sunday, September 25, 2016. Also, the Rohit Sharma crossed his 1000 Test runs by his today’s Fifty. This article is about Aswin 200 Test Wickets, and New Zealand’s second innings batting. It is 499th Test Cricket for the Venue and 500th Test for the team, India. Here, it is the Fourth day of this first test in India at Kanpur Stadium. The Indian Team won the toss and scored 318 in the first innings for all out in 97 overs and the New Zealand scored 262 for all out in 95.5 overs. So, the Tem India lead by 56 runs after the end of First Innings. The Third innings scorecard is now on the board. The Indian team declared after the score reached 377 runs in 107.2 overs by five wickets. Four Indian batsmen crossed the 50 runs in this second innings. Vijay, Pujara, Rohit Sharma, Jadeja are all scored 76, 78, 68, and 50 respectively. The New Zealand team is scoring now on the ground with the 6 wickets in their hands. The team scored 91 runs for 4 wickets in 32 overs. Ravichandran Ashwin took 3 wickets out these four wickets. And he reached the fastest milestone today. He is the second man who took 200 wickets in the short period. Early, Clarrie Grimmett (Australia) was took 200 wickets in 36 matches. 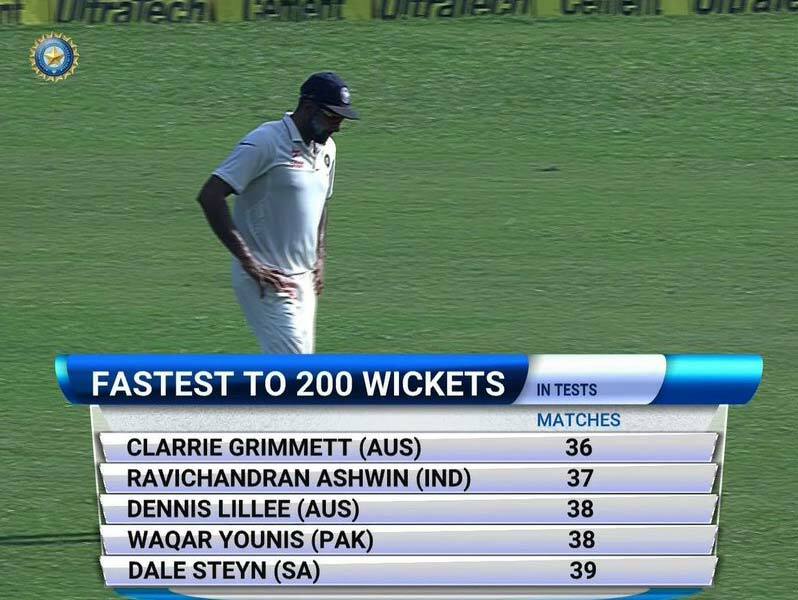 R Ashwin reached that massive height in 37 matches by taking three consecutive wickets. The Fourth wicket has also related to Ashwin. Ross Taylor has been run out in his Over 21.3 by Yadav. 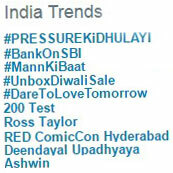 The Twitter India is now trending with these two words “Ashwin, Ross Taylor, and 200 Test.” It says as Aswin 200 Test Wickets. VIDEO: Rohit Sharma scored his half century in this India’s 500th Test Match Today. And he reached his 1000 test run milestone today. Ravichandran Ashwin, who became as a Second World Fastest 200 Wicket taker in International Test Cricket. At the end of this 4th day, New Zealand needs 341 runs to win with 6 wickets remaining. Video: Jadeja celebrates his FIFTY and Virat Kohli declared the India’s Second innings. Ashwin: The challenge from the opposition is always good. For example, Williamson was playing really well. Taylor was playing back. It’s a combination of playing good batsmen, conditions and match situations that makes this satisfying. I think its too early to talk about my achievements I have a long way to go.